This easy corn salsa made with lime, cilantro and tomatoes are perfect with chips or served over your favorite tacos or burrito bowls! It’s a perfect combination of sweet, spicy and tangy. You can adjust the heat according to your taste! Try it over Barbacoa Beef, so good! Combine all the ingredients and refrigerate for about an hour. Makes about 3 cups. Last comment should have been for the barbacoa – sorry! This was amazing! My family loved it so much – Thank you. We don’t like really spicy so I substituted 3T mild green chiles for the chipotle peppers. It was perfect for us. Also made your corn and lime salsa (no jalapenos) and that was fantastic too. I would like to can this? Does anyone with experience know how I could do so? 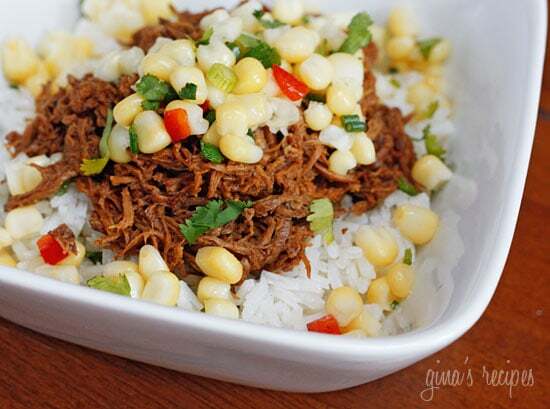 Made this corn salsa this week with your Barbacoa Beef and cilantro brown rice, so yummy! 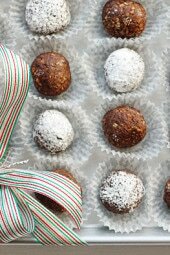 Thank you so much for sharing this recipe, it is fantastic! I made this with the Barbacoa Beef tonight. My kids loved both dishes! I think this would be 0 smart points now because of the new Freestyle program!!! Just a note for people who really do want a mild jalapeño. It’s not the seeds that contain the capsaicin oil. It’s the placenta which is the “ribbing” that the seeds are attached to. So, don’t just take off the seeds, cut off the ribbing all the way back to the wall of the pepper. This salsa is insanely delicious…and addicting! Yum. This recipe is beyond amazing!!! This sounds awesome!! Can I can this? Everything in this recipe is available from my garden….also, would you roast or boil the corn?? Just finished making this, it is in the refrigerator until dinner tonight. Pairing this with the Barbacoa beef and cilantro lime rice… I’m beyond excited!! Thanks for all the great recipes Gina! I’ll post again after we’ve eaten it! Wonderful recipe, esp. since fresh corn and tomatoes are in season. I omitted the cilantro and onion, increased the tomatoes. The fresh lime juice is the secret ingredient! Definitely improves with sitting in the fridge. This was such a great dish for the hot summer! I grilled the corn out on the BBQ to avoid heating up the house. The flavors are very complex and complimentary. I have munched on it for the last 2 days and it just keeps getting better and better as the flavors meld. Thank you Gina for sharing your talents with those of us who are "culinary-challenged"! Loved this salsa! Just FYI, I put the recipe into WW recipe builder and it came out 2+ per serving… Just wondering if the stats are right. Used this recipe with pickled red onions and it was amazing! I had some corn salsa at a restaurant last weekend and found out that the pickled onions made it sweet. I tried to get the recipe but no luck so I used this one. My husband raves about it – it will be a staple with our grilled catfish from now on! Gina, how long do you think this would be good in the fridge? I made it about a week ago and we have been munching on it ever since! I just discovered your site and I love it! I made the corn salsa tonight and last night I made the pico de gallo. Yummy!! I can't wait to try more of your delicious recipes! I made this but grilled the corn and gave it the next level I was looking for. My husband loved it! I also added red pepper to it to give it more crunch! Yummmm…. All I can say is "Wowww!" I had this for dinner tonight along with the barbacoa beef and white rice, and it was delicious!!! Thanks so much for sharing your recipes! Maybe try another supermarket, it's in the spice aisle, or use any chile powder. Love your site! Where do you buy chipotle chili powder? I have looked at Safeway and no luck. Thanks. Can't wait to make this. I would eat it over rice and beans. Plain rice I'm not too sure if I would like. Hi. I was wondering if you think this would taste good over plain white rice??? Thanks. 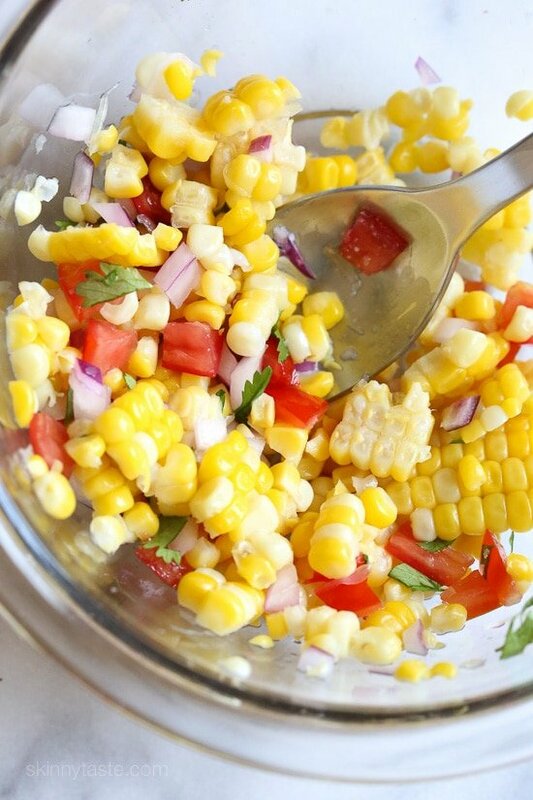 Yes, this is amazing with fresh grilled corn! this is an awesome recipe! Used grilled corn if you can. I made this for a girls weekend at a cabin and it was amazing! I recommend this dip with baked chips! The container was empty in a matter or 2 hours! THUMBS UP! I will definitely have to try this. It sounds wonderful. I make something similar with whole kernal corn, cucumbers, grape tomatoes (cut in half), lime juice, olive oil, salt and pepper and a couple packets of Splenda. It always gets rave reviews. YUMMY! I have been keeping this around the house for snacks and side dishes. PERFECT to go with anything off the grill … burgers, chicken, shellfish, etc. Made a perfect side with your zucchini turkey burgers! this was to die for! actually every recipe i've tried has been delicious! If you use fresh corn do you boil it or grill it and then just cut from the cob? 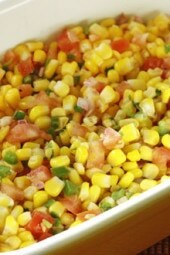 Never made corn salsa before but it looks yummy!!! Thanks! Fresh corn works best here but frozen would do. This looks amazing! I can't wait to try it. I also added a link to your site from my blog of daily tips as I just did a post on weight watchers. You have a great site. I am a new subscriber and can't wait to check out all the recipes. Hi Gina!! I would like to publicly state I normally do not GOBBLE lol however I confess in this case GUILTY as charged!! This was absoulutely delicious and so light (lol except the chips)! @mamafliz- Yay, I am part Latina (my mom) and plan on making many more lighter Latin meals in the future. Glad this is helping you stay on track. @Lori- where are you going?? Enjoy your girls trip! @Kassie- I'm sure it will be great. Happy Chipotle night! 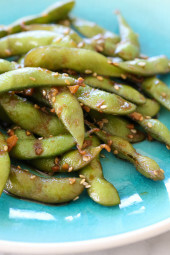 I make something very similar to this, but I add black beans for extra flavor and fiber! I also add cumin. We LOVE this stuff as a side dish, salsa, salad, etc! I tried this recipe last night. It turned out very pretty, but I haven't had a chance to taste-test it. I used half of a poblano chili pepper instead (since I didn't have any jalopenos). Do you think the flavor will still be good?? I plan on making the Chicken Ropa Vieja tomorrow and having a Chipotle at home night! Thanks Gina. This will be great to take on our Girls Weekend trip in April, any other ideas? By the way, thanks for all you do, I look forward to your new recipes each day. My kids and husband LOVES the lime garlic steak and they loved it with chicken too, we used the leftovers for enchiladas…delicious. Mmm, I always put this corn salsa in my burrito at Chipotle. I think it's amazing… and the rice is why I come back! Thanks. Fresh corn is ideal but I used frozen. Grilled corn on the cob is even better! I've never made corn salsa, but often order it at Qdoba restaurant on my burrito. 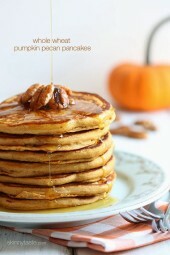 Definitely trying this recipe! I love corn salsa. Thanks for a new recipe!! Wow this looks great! Could you tell me what kind of corn you used? Was wondering if I could use frozen or canned?? Thanks so much! OMG this looks wonderful, I can't wait to try it! shut right up! (And I only mean that in a good way). I love this stuff and can't wait to try it myself!